V.I.P 360 is a QLD wide manpower, cash logistics & electronic security company. We have a position for a Electronics Technician or Security Technician to provide maintenance & repairs on a range of cash logistic machines in the Mackay region. We service note counters, coin dispensers, ATM’s and other types of currency logistic machines. We also have other optional work installing and servicing security systems such as cameras, alarm systems and access control. If you have experience with this equipment or similar equipment we would love to hear from you! If you have a Class 1 or Class 2 Security license or are interested in obtaining one, we have other work opportunities in our manpower security division. If you have experience in maintenance/ repairs on similar machines we believe you can learn the machines we service. Detectives from the Upper Mount Gravatt Criminal Investigations Branch are investigating a suspicious fire in Mackenzie that occurred late last night. Preliminary investigations indicate that around 10.15pm, three men have smashed a window of the Botticelli Place residence, poured an accelerant into the dwelling and ignited it. The three men then fled the scene in a vehicle. Fire services attended and extinguished the fire, which was contained to the front room of the house. A man and a woman who were inside the residence at the time of the incident were transported to hospital with non-life-threatening injuries. Two other occupants who were also inside the residence at the time of the incident were not injured. Anyone who may have seen anything suspicious in the area around the time of the incident is urged to contact police. A pedestrian died in a traffic incident at Nerang last night, November 1. Preliminary investigations indicate a man and vehicle collided at the intersection of Weedons Road and Crusader Way around 8.30pm. The pedestrian, a 42-year-old local man, died at the scene. Police have charged a woman following investigations into a fatal traffic crash on Magnetic Island on June 1 this year. Around 1am, police attended Sooning Street in Nelly Bay and discovered a mini moke had left the roadway and crashed into a power pole after failing to negotiate a roundabout. The two men, aged 41 and 48, were pronounced deceased at the scene. A woman who was driving the vehicle was taken to the Townsville Hospital with non-life threatening injuries. A 26-year-old Richmond Hill woman has been charged with two counts of dangerous operation of motor vehicle causing death and driving under the influence. The woman appeared in the Townsville Magistrates Court today and will next appear in Townsville Magistrates Court on December 13. The owner of a silver coloured 2005 model Mitsubishi Lancer registration number 428 JFC has had her car stolen today while she was standing three metres away hugging her daughter. The victim started her car and drove it a short distance in front of the home driveway in Pirie Street, South Mackay. The car was being moved so that the victim’s daughter could move her car out of the driveway. She has then hopped out of the car, leaving it running, while she moved to the rear of her car to hug her daughter. As she gave her daughter a hug – she heard her vehicle rev loudly, and watched it driven away by a thief. The image above does not depict the actual stolen car – but displays a similar colouring, make and model. 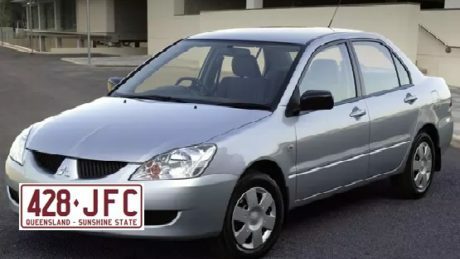 If you have any information about the current location of this stolen car, please report it to the Mackay police station on 0749 683 444 or you can contact Crime Stoppers on 1800 333 000. The police report number to refer to is QP1701914322. I am not sure that I have seen a more suitable set of circumstances to describe the words – opportunistic crime! The car thief in this matter was simply in the right place at the right time. Shortly after the car was stolen it’s alleged it was driven to a local service station in Paget where it also became involved a fuel drive-off offence. Two motorcycles were stolen from a business on Dutton Street, Walkerston between 5 pm on October 31 and 7:30 am on November 1. Attempts were made to steal a third. The business has been entered from the rear of the building, although an exact entry point has not yet been confirmed. Once inside offenders have moved into an upstairs area and turned on lights – even turned on a television. Efforts were made to move/steal a further Kawasaki dirt-bike but were not successful. We unfortunately don’t have images at this time of the stolen motorcycles to share with you through this site. Anyone who may have information about the offence itself or the current location of either of the stolen motorcycles is encouraged to call either the Walkerston police station on 0749 592209 (not a 24 hour station), Mackay police station on 0749 683 444 or Crime Stoppers anonymously on 1800 333 000 any time of the day. The police report number to refer to is QP1701912636. Residents of Saltbush Boulevard, Alexander and Escriva Courts in Rasmussen received a welcome visit from police officers from the Rapid Response and Patrols who were accompanied by staff from various government departments this morning. 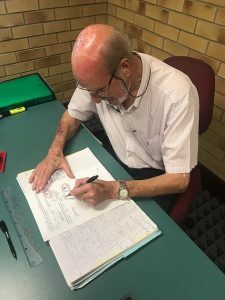 The visit gave residents the opportunity to discuss any concerns they had regarding crime, Centrelink payments, housing issues and any other services to assist with their living conditions. 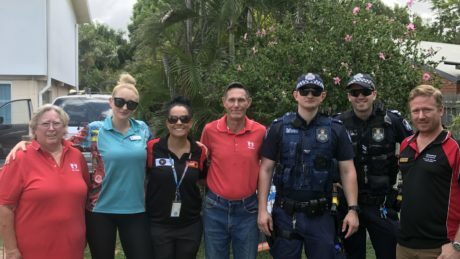 Inspector Glenn Doyle, Co-ordinator of the Townsville Stronger Communities Action Group said residents were overwhelmed to see so many different government agencies in their street taking an interest in their area. “These types of visits will become a regular event in areas where police have a high call for service,” Inspector Doyle said. Justice of the Peace (JP), Mr Don Pollard joins our existing Justice of the Peace, Mr John Richardson (JP) and the team at Coomera Police Station to expand our services within the Coomera Police Division. Mr Richardson and Mr Pollard will be able to assist the community with any JP services at the Coomera Police Station reception area from 8am to 11:30am every weekday (Monday to Friday). JP Services can also be located at your local shopping centre, community centre or after hours by contacting a JP listed here. For more information about JPs in Queensland, visit the Queensland Government website here. It is alleged the property was gained by breaking into and stealing from cars in the Palm Beach, Ashmore and Southport areas. 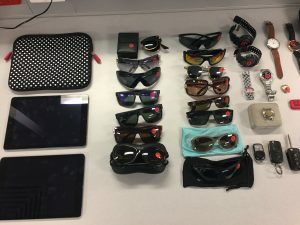 Investigations led police to a 28-year-old Ashmore man who has been charged with 47 offences relating to stolen property and unlawful entry of vehicle offences. The man appeared in the Southport Magistrates Court yesterday. Police have released images of some of the suspected stolen property and are appealing for any members of the public that might recognise any items as theirs to contact Burleigh Heads Police establishment on (07) 55 860 444. A new police taskforce recently set up in Logan is closing in on unsolved crime after teaming up with Griffith University in an effort to gain a clearer understanding of the causal factors behind robberies taking place across the district. Established in July the Logan District Robbery Taskforce, working in conjunction with the Logan District CIB has already arrested 34 people on almost 40 robbery with violence charges. Detective Inspector Tod Reid said the taskforce has been developed with the aim of overviewing, investigating and resolving unsolved robberies in the Logan District. “Using their full range of capabilities the taskforce will assume investigative responsibility for all robberies after seven days from when the offence occurred,” Detective Inspector Reid said. Detective Inspector Reid said the Logan Criminal Investigation Branch (CIB) recently partnered with Griffith University’s School of Criminology and Criminal Justice to get a clearer understanding of the causal factors behind robberies taking place across the district. “A thorough analysis of the robbery occurrences that occurred in public space between June and September this year delivered four key findings,” Detective Inspector Reid said. Detective Inspector Reid urged the public to be aware of their surroundings, make efforts to conceal their belongings, ensure their phones are protected with a pin code and where possible, try and walk with a friend or travel with others. “We have released footage of four particular unsolved matters that have occurred in the Logan area this year,” Detective Inspector Reid said. CCTV vision of four robberies among a number of unsolved matters the taskforce is investigating can be downloaded below.